Merging educational neuroscience with a formative assessment process and differentiated instruction, LeAnn Nickelsen and Melissa Dickson developed a four-step cycle of instruction—(1) chunk, (2) chew, (3) check, and (4) change—that has the power to double the speed of student learning. Compatible with any subject area, the book’s brain-friendly teaching strategies and plentiful tools are designed to help transform students into active learners and independent thinkers. Combine brain science with a formative assessment process and differentiated instruction to maximize student learning. Examine effective teaching strategies and differentiation practices so you can bump it up or break it down according to student needs. 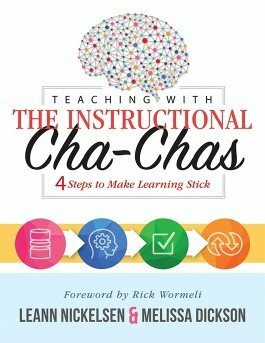 Consider the four-step instructional cycle and understand the components of chunk, chew, check, and change. Explore how the formative assessment process can double the speed of learning. Learn how to plan instruction and preassess efficiently so that daily learning targets and formative assessments enable each student to meet standards. Receive templates and teaching strategies that can be easily differentiated and implemented in daily lesson plans.